The opisthokonts (Greek: ὀπίσθιος (opísthios) = "rear, posterior" + κοντός (kontós) = "pole" i.e. "flagellum") are a broad group of eukaryotes, including both the animal and fungus kingdoms. 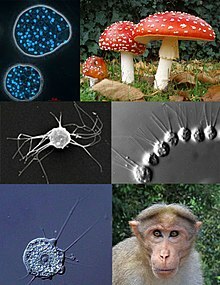 The opisthokonts, previously called the "Fungi/Metazoa group", are generally recognized as a clade. Opisthokonts together with Apusomonadida and Breviata comprise the larger clade Obazoa. Opisthokont characteristics include synthesis of extracellular chitin in exoskeleton, cyst/spore wall, or cell wall of filamentous growth and hyphae; the extracellular digestion of substrates with osmotrophic absorption of nutrients; and other cell biosynthetic and metabolic pathways. Genera at the base of each clade are amoeboid and phagotrophic. Opisthokonts are divided into Holomycota or Nucletmycea (fungi and all organisms more closely related to fungi than to animals) and Holozoa (animals and all organisms more closely related to animals than to fungi); no opisthokonts basal to the Holomycota/Holozoa split have yet been identified. The Opisthokonts was largely resolved by Torriella et al. Holomycota and Holozoa are composed of the following groups. The choanoflagellates have a circular mitochondrial DNA genome with long intergenic regions. This is four times as large as animal mitochondrial genomes and contains twice as many protein coding genes. Corallochytrium seem likely to be more closely related to the fungi than to the animals on the basis of the presence of ergosterol in their membranes and being capable of synthesis of lysine via the AAA pathway. The ichthyosporeans have a two amino acid deletion in their EEF1A1 gene that is considered characteristic of fungi. The ichthyosporean genome is >200 kilobase pairs in length and consists of several hundred linear chromosomes that share elaborate terminal-specific sequence patterns. In the following phylogenetic tree it is indicated how many millions of years ago (Mya) the clades diverged into newer clades. The holomycota tree is following Tedersoo et al. ^ Adl, S.M. ; et al. (September–October 2005). "The new higher level classification of eukaryotes with emphasis on the taxonomy of protists". Journal of eukaryotic microbiology. 52: 399–451. doi:10.1111/j.1550-7408.2005.00053.x. PMID 16248873. ^ Shalchian-Tabrizi K, Minge MA, Espelund M, et al. (7 May 2008). Aramayo R (ed.). "Multigene phylogeny of choanozoa and the origin of animals". PLoS ONE. 3 (5): e2098. Bibcode:2008PLoSO...3.2098S. doi:10.1371/journal.pone.0002098. PMC 2346548. PMID 18461162. ^ "Fungi/Metazoa group". Retrieved 2009-03-08. ^ a b Steenkamp ET, Wright J, Baldauf SL (January 2006). "The protistan origins of animals and fungi". Mol. Biol. Evol. 23 (1): 93–106. doi:10.1093/molbev/msj011. PMID 16151185. ^ Huang, Jinling; Xu, Ying; Gogarten, Johann Peter (November 2005). "The presence of a haloarchaeal type tyrosyl-tRNA synthetase marks the opisthokonts as monophyletic". Molecular Biology and Evolution. 22 (11): 2142–2146. doi:10.1093/molbev/msi221. PMID 16049196. ^ Parfrey, Laura Wegener; et al. (December 2006). "Evaluating support for the current classification of eukaryotic diversity". PLOS Genetics. 2 (12): e220. doi:10.1371/journal.pgen.0020220. PMC 1713255. PMID 17194223. ^ Torruella, Guifré; et al. (February 2012). "Phylogenetic relationships within the Opisthokonta based on phylogenomic analyses of conserved single-copy protein domains". Molecular Biology and Evolution. 29 (2): 531–544. doi:10.1093/molbev/msr185. PMC 3350318. PMID 21771718. ^ Eme, Laura; Sharpe, Susan C.; Brown, Matthew W.; Roger, Andrew J. (2014-08-01). "On the Age of Eukaryotes: Evaluating Evidence from Fossils and Molecular Clocks". Cold Spring Harbor Perspectives in Biology. 6 (8): a016139. doi:10.1101/cshperspect.a016139. ISSN 1943-0264. PMC 4107988. PMID 25085908. ^ Adl, Sina M.; Bass, David; Lane, Christopher E.; Lukeš, Julius; Schoch, Conrad L.; Smirnov, Alexey; Agatha, Sabine; Berney, Cedric; Brown, Matthew W. (2018-09-26). "Revisions to the Classification, Nomenclature, and Diversity of Eukaryotes". Journal of Eukaryotic Microbiology. doi:10.1111/jeu.12691. ISSN 1066-5234. ^ Wainright PO, Hinkle G, Sogin ML, Stickel SK (April 1993). "Monophyletic origins of the metazoa: an evolutionary link with fungi". Science. 260 (5106): 340–2. Bibcode:1993Sci...260..340W. doi:10.1126/science.8469985. PMID 8469985. ^ Stechmann, A.; Cavalier-Smith, T. (5 July 2002). "Rooting the eukaryote tree by using a derived gene fusion". Science. 297 (5578): 89–91. Bibcode:2002Sci...297...89S. doi:10.1126/science.1071196. PMID 12098695. ^ Torruella, Guifré; Mendoza, Alex de; Grau-Bové, Xavier; Antó, Meritxell; Chaplin, Mark A.; Campo, Javier del; Eme, Laura; Pérez-Cordón, Gregorio; Whipps, Christopher M. (2015). "Phylogenomics Reveals Convergent Evolution of Lifestyles in Close Relatives of Animals and Fungi". Current Biology. 25 (18): 2404–2410. doi:10.1016/j.cub.2015.07.053. ^ Tedersoo, Leho; Sánchez-Ramírez, Santiago; Kõljalg, Urmas; Bahram, Mohammad; Döring, Markus; Schigel, Dmitry; May, Tom; Ryberg, Martin; Abarenkov, Kessy (2018). "High-level classification of the Fungi and a tool for evolutionary ecological analyses". Fungal Diversity. 90 (1): 135–159. doi:10.1007/s13225-018-0401-0. ISSN 1560-2745. Eichinger, L.; Pachebat, J. A.; Glöckner, G.; Rajandream, M. A.; Sucgang, R.; Berriman, M.; Song, J.; Olsen, R.; et al. (2005). "The genome of the social amoeba Dictyostelium discoideum". Nature. 435 (7038): 43–57. Bibcode:2005Natur.435...43E. doi:10.1038/nature03481. PMC 1352341. PMID 15875012. Wikimedia Commons has media related to Opisthokonta.